On 2005-DEC-01, American Atheists (AA) initiated a lawsuit -- American Atheists, Inc. v. Duncan -- at the federal U.S. District Court for the District of Utah 6 to stop the Utah Highway Patrol and the Utah Department of Transportation from erecting large, 12 foot tall, metal Christian crosses on state property. The plaintiffs had no problems with the concept of roadside memorials. They just objected to them taking the form of a large Christian cross. The American Atheists' apparently are not troubled by the use of a marker of some type as a memorial to recognize the location where a state trooper died. They seem to be solely concerned that a religious symbol -- a Christian cross -- is used as the marker, and the attachment of the Utah Highway Patrol beehive logo on the crosses. "Ironically, the state Transportation Department has a specific regulation prohibiting the placement of religious symbols and shrines on or adjacent to any public highway. 3 It is also state policy to remove the illegal memorials. Citizens may place wildflowers along a road, however, get involved in the Adapt-A-Highway program, or sponsor a 'memorial sign' with a secular safety message like 'Drowsy Driving Kills'." The four plaintiffs -- constitutional attorney Brian Barnard of the Utah Legal Clinic, and three members of American Atheists: Stephen Clark; Utah State Director Michael D. Rivers; and veteran First Amendment activist Richard Andrews -- have asked for $1.00 in damages "...plus attorney fees and court costs...". 3 They are also seeking a ruling that the use of crosses and the placement of the Utah Highway Patrol logo on the crosses is unconstitutional. Ellen Johnson, President of American Atheists indicated that many future lawsuits will be filed in other states. She told reporters: "It's a growing problem across the country. We end up with these little Christian shrines everywhere." "The state is giving the impression that government is endorsing religion....We know that religionists are going to scream about this lawsuit and claim it's an example of discrimination. But the government has no business promoting one religion over another, or religion in general." "We feel the department of transportation, by allowing the Utah Highway Patrol Association to pick a religious symbol is unfair. We think that it should be totally secular with no religious theme." "The presence of the Latin crosses on government owned property with the Utah Highway Patrol logo prominently displayed thereon has the primary effect to advance religion, and conveys or attempts to convey the message that religion or a particular religious belief is favored or preferred. The reaction of the average receiver of the government communication or average observer of the government action is that of endorsement of religion and particularly of Christianity..."
"The Latin cross is a very familiar and poignant religious symbol exclusive to Christianity.....The reaction of the average....observer of the government action is that of endorsement of religion and particularly of Christianity." Many Jews, Native Americans and other groups who have been oppressed, discriminated against, and the victims of mass murder at various times by Christians might probably disagree that the cross is a peace symbol. Nigbur also pointed out that "a large number" of crosses have been placed on private property adjacent to public roads. "less than honest....I don't think there is any question that troopers should be honored. They have given the ultimate sacrifice. But they can be honored in a way that doesn't emphasize religion." "We've taken God out of the schools, out of city council meetings and taken the Ten Commandments out of government. It's time we stand up and put God back in our country." The case was appealed to the Tenth Circuit Court of Appeals. Amici curiae briefs filed with the court included those by: The Unitarian Universalist Association, the Union for Reformed Judaism, The Society for Humanistic Judaism, the Interfaith Alliance, the Hindu Foundation, the Anti-Defamation League, Americans United for Separation of Church and State, American Humanist Association, Foundation for Moral Law, the American Legion, States of Colorado, Kansas, New Mexico and Oklahoma, the Becket Fund for Religious Liberty, the City of Santa Fe, the Utah Sheriff's Association, and 21 individuals. "When someone driving sees that white cross, what goes through their mind? Someone died here, and not Jesus Christ. The context of the cross on the side of the road, means death. What else would you put up?" 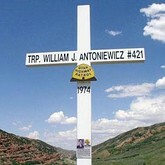 "Atheists file suit to stop Utah Christian roadside memorials," AANews #1191, American Atheists, 2005-DEC-03. Utah Code Ann. § 72-7-102 & 104 (1953 as amended).